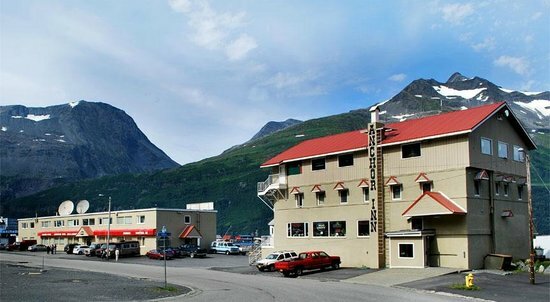 The Anchor Inn is in the heart of Whittier, located in the center of the residential and commercial areas of Whittier. Often you will find locals hanging out, workers passing through and catching a meal, or travelers from afar checking out the Whittier scene. Dating back to 1980, the Anchor Inn has been a family owned establishment. The Anchor Inn boasts a three level building, complete with a restaurant, landromat, lodging, public telephones, and nightime entertainment (The Overview Lounge). In addition, an adjacent building offers additional lodging, a mid-sized grocery store stocked with almost every imaginable thing a grocery store should have, as well as a museum of local history, which recently opened in June 2005. An interesting thing about the Anchor Inn that most travelers don't realize is that every room in the Anchor Inn is unique. The buildings have evolved over time, and continuing improvements have made it hardly recognizable from the Army Communications and Headquarters they once were. The town of Whittier is nestled in a valley where the beautiful Passage Canal ends at the glacier-covered Chugach Mountains. Originally a military base, boasting protective mountains and the world's most northerly deep water ice-free port, Whittier has become one of the most easily accessible small towns in Alaska. Before the one lane tunnel was built in 199x connecting Whittier to Anchorage and the Kenai, Whittier was only accessible to modern travelers by boat or plane. Being isolated in a small community from the rest of the world in some of the most beautiful nature in existence creates a special feel. The town's residents can attest to it, choosing to live here because they love Whittier, for one reason or another. With less than 200 year round residents, most of the residents are not native to Alaska, coming from the lower 48 and overseas. Regardless, Whittier definitely has its own unique culture and character in Alaska, although easily hidden from or misunderstood by the outside world. Whittier also has a very interesting history, as chronicled in the Strangest Town in Alaska, a book by Alan Taylor.